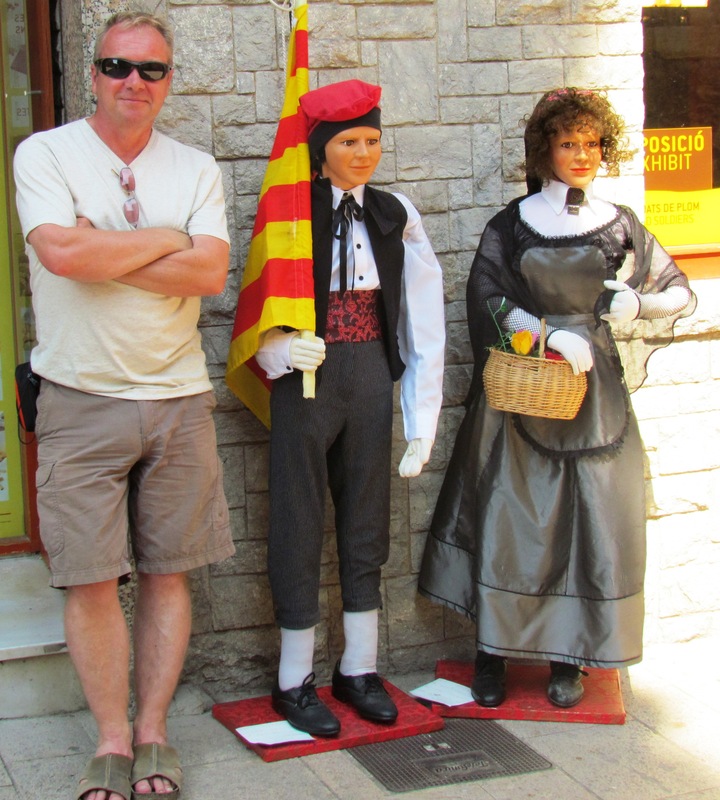 I pose with two life size figures dressed in Catalan National Costume. I was interested in the issue of Catalan independence and tried when I could to speak to people about where they stood on the issue because polls reveal that almost 60% of the population support independence. Everywhere there are Catalan flags and symbols, Catalan always comes first in guide books and menus, shops don’t sell King Juan Carlos souvenirs, on official guides the flag of Spain is almost always defaced and the away team colours of FC Barcelona are the red and gold of Catalonia. It is the sixth largest region in Spain, has the sixth largest coastline and is sixth largest by population density (second overall after Andalusia). If it were to achieve independence it would be the twelfth smallest state in Europe just slightly larger than Belgium but a bit smaller than the Netherlands. If the evening meal at the Masalbereda hotel had been good then breakfast was even better. It was served in the smart restaurant on a balcony overlooking the gardens and consisted of local cheese and sausages. Sausages are a speciailty of Vic on account of the fact that the mountain valley is well known for its pig farming. There were at least eight varieties to select and sample and although I am sometimes wary about sausage there wasn’t one here that wasn’t delicious – even the vegetarian one made from potato! Today we were moving on from Vic to the nearby town of Ripoll and soon after breakfast we took the short thirty minute drive to the neighbouring town back in the Province of Girona and arrived at our next stop in the village of Campdevànol at eleven o’clock where we simply wanted to leave our luggage but luckily our room was prepared and ready so we were able to check in to the Hotel Sèquia Molinar. Our plan today was to take a railway journey into the Pyrenees and the timetable showed a convenient train at half past one so that gave us an hour or so to walk into the village to take a look around. 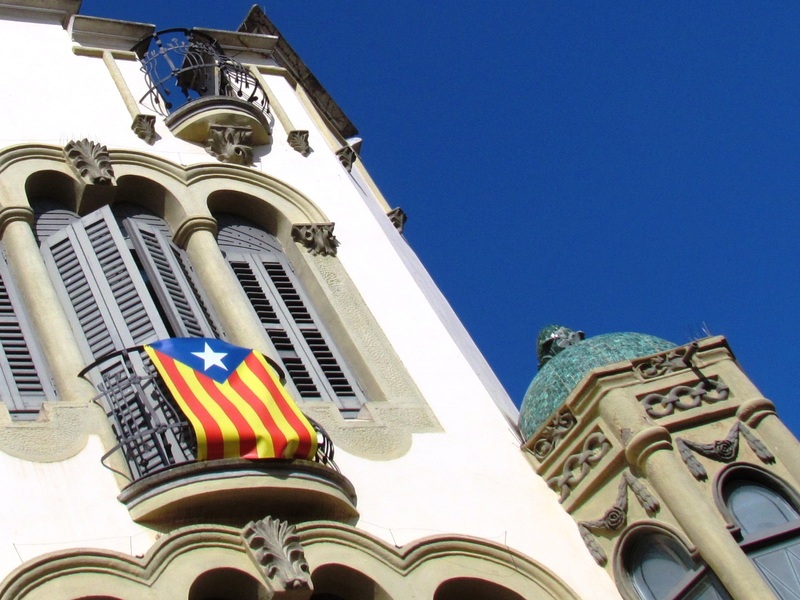 It was an unremarkable little place but just as everywhere else a lot of the buildings were draped with the red and gold flag of Catalonia, some already anticipating a successful transition to independence and rather prematurely announcing themselves as ‘A New State for Europe’. To achieve this they are planning a referendum in 2014 and are in a race with Scotland to get there first. The two parallel campaigns have been described as similar but Catalans reject this comparison and point out that Scotland is a part of the United Kingdom by contract in the Acts of Union of 1707 (someone should tell Alex Salmond) whereas they are more like Wales and consider their inclusion in the Kingdom of Spain to be as a result of conquest and subjugation. I have to conclude that Catalonia certainly doesn’t feel like the classic Spain of Castile but then again Andalusia doesn’t actually feel like the classic Spain of Castile either. 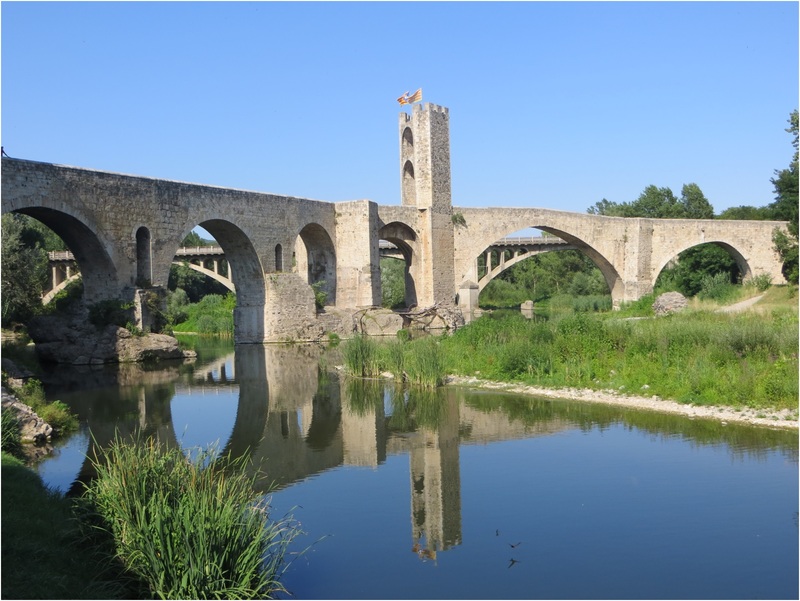 I have now visited fourteen of the seventeen Autonomous Communities and I would find it very difficult to choose one that I might then suggest is most representative of the usual English vision and expectation of Spain. Castile must come close, or perhaps Valencia or even Extremadura, certainly not Galicia, Asturias, Cantabria or the Basque Country and I am yet to travel to Aragon or Navarre so cannot offer an opinion on these. I was interested in the issue of Catalan independence and tried when I could to speak to people about where they stood on the issue because polls reveal that almost 60% of the population support independence which, if you believe polls, is much greater support for independence than in Scotland. Everywhere there are Catalan flags and symbols, Catalan always comes first in guide books and menus, shops don’t sell King Juan Carlos souvenirs, on official guides the flag of Spain is almost always defaced and the away team colours of FC Barcelona are the red and gold of Catalonia. Here in Campdevànol the hotel staff told me that they considered themselves to be Catalan first and Spanish second although they feared that the referendum for independence would ultimately fail because of the inherent conservatism of the older generation and because, whatever the outcome of a referendum, Madrid would simply never allow it. 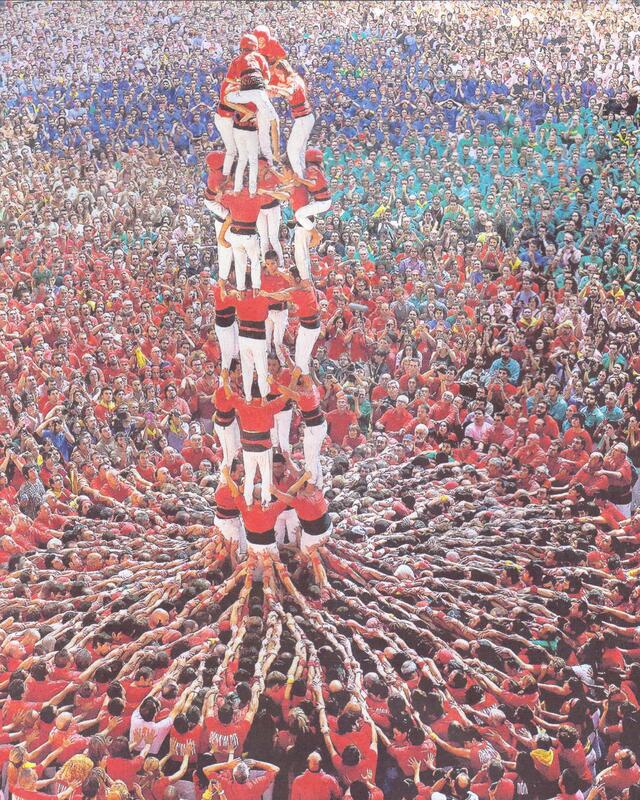 As well as history, economics is a major driving force behind the movement because Catalonia is one of the most prosperous of the Spanish Communities and although it enjoys considerable autonomy it resents contributing almost 20% of revenues paid to Madrid and feels hard done by in terms of inward investment in their region in return. It is the sixth largest region, has the sixth largest coastline and is sixth largest by population density (second overall after Andalusia). If it were to achieve independence it would be the twelfth smallest state in Europe just slightly larger than Belgium but a bit smaller than the Netherlands, it would have ninety of Spain’s five hundred and fifty blue flag beaches (16%) and six of its forty-four World Heritage sites (14%). It didn’t take long to see everything that there was to see in Campdevànol so we returned to the hotel and then drove the short distance to Ribes de Freser and the train station where I was surprised to see the mountain railway just leaving the station at one o’clock. Beyond buying beer or ordering a meal I don’t understand a lot of Spanish and I certainly don’t speak Catalan and I offer this as the reason why I had misread the train timetable and was working on the weekend schedule when this was only Friday. The next train now wasn’t for a couple of hours so accepting the consequences of our unfortunate timing we now had time to spend some time in the little town. This is me with two life size figures dressed in Catalan National Costume.